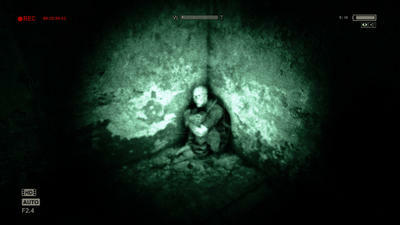 Indie horror darling Outlast is getting a sequel thanks to the fine folks over at Red Barrels. The studio is aiming for a release in autumn 2016. Outlast 2 will be "a twisted new journey into the depths of the human mind and its dark secrets," and it will return players into the horrors of an asylum gone to hell. Co-founder Philippe Morin gives the game a cheerful description with the release of the teaser. "Outlast 2 will test your faith, pushing players to a place where going mad is the only sane thing to do." Red Barrels hasn't shared anything else besides the teaser and a few hints. It's been a full year since the game was confirmed to be in development, and we have a full year until it comes out.The studio is running the whole two year gauntlet with a perfectly timed teaser in the middle. You'll probably be able to pick up a copy around Halloween next year, just to give yourself an extra little fright. Outlast 2 will be released for the PC, PlayStation 4 and Xbox One in Fall 2016.